Remember a couple weeks ago when I shared my Dinner Menu Inspiration with you? 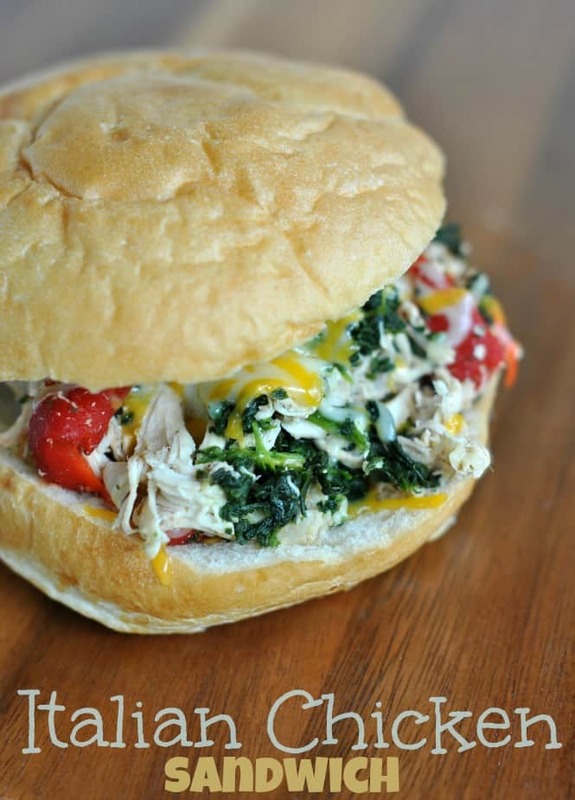 Roni made some Italian Pulled Chicken Sandwiches with Tomatoes and Kale. Last night I set out to make these sandwiches. But of course, I didn’t follow the recipe. At all. I was at the grocery store and couldn’t remember the ingredients. So using that photo as my inspiration I set out to make my own sandwiches. And they turned out delicious! I threw some chicken into my slow cooker with some salt, pepper, Italian seasoning, garlic salt and crushed red pepper. I let it cook on low all day until it was tender enough to shred (about 5 hours). Don’t open your lid during this time or you will lose moisture! Want more dinner inspiration? Check out my Pinterest Boards! I love making dinner in my slow cooker! 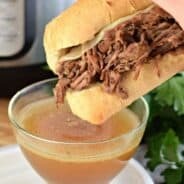 Here are a few of my favorite recipes. Be sure to click on the link or photo to take you to the recipe! 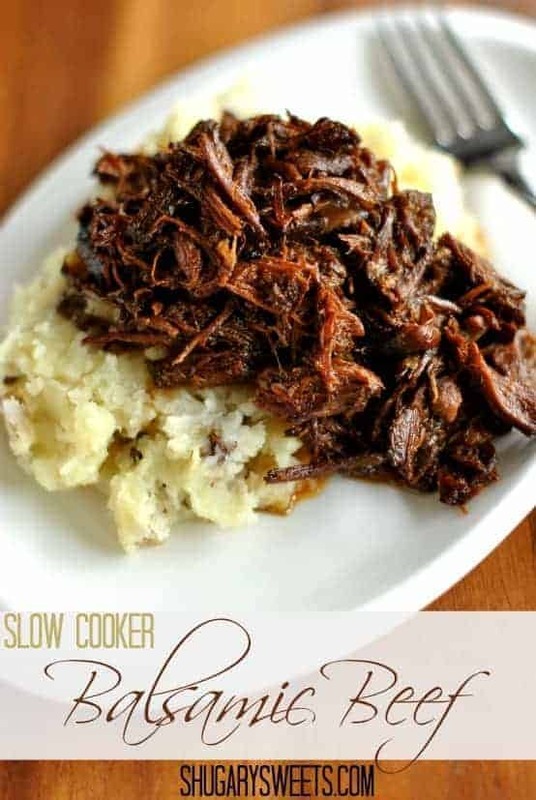 Slow Cooker Balsamic Shredded Beef: easy, delicious and perfect with a side of mashed potatoes! 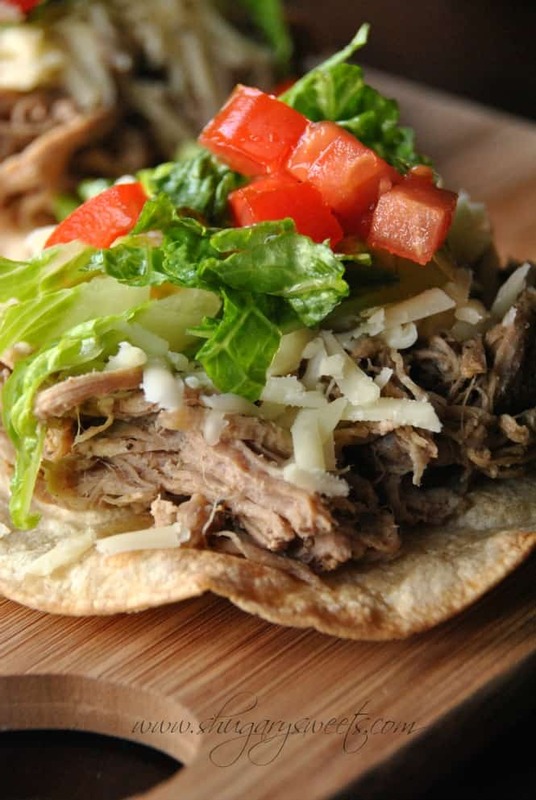 Jamaican Jerk Pulled Pork Tostadas: orange juice and jerk seasoning create a delicious tang to this pulled pork recipe! 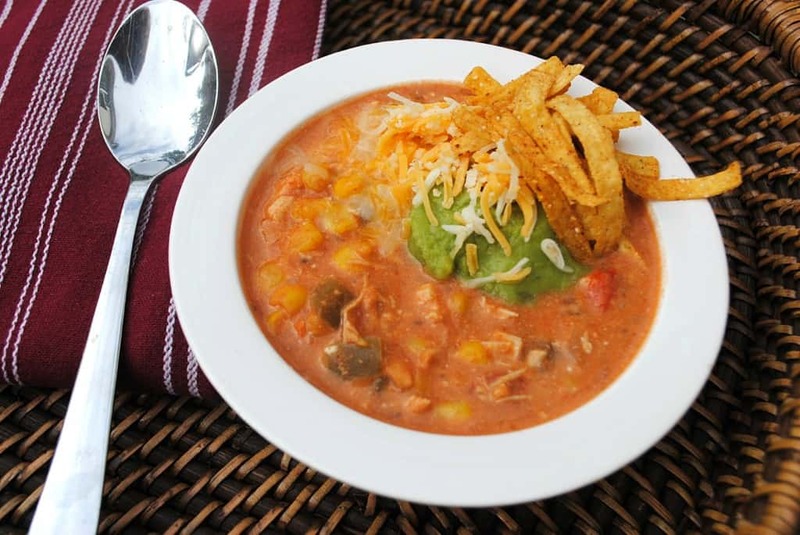 Chicken Taco Soup: This is one of our families favorite meals, it appears on the menu least once or twice a month! 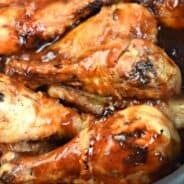 Add chicken to large slow cooker. Add seasonings, cover and cook on low for about 5 hours. 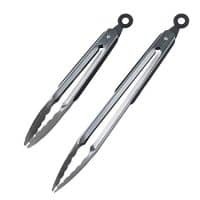 Using two forks, shred chicken. Add chopped red peppers and thawed, chopped spinach. Allow to heat thoroughly, about 1-2 hours. When ready to serve, assemble bun with shredded cheese (desired amount) and scoop of shredded chicken mixture. ENJOY. For the frozen spinach, after it thaws squeeze package to remove some (not all) of the excess water. I like how you roll, making recipes up on the fly! This looks so good Aimee! Love crockpot recipes! I’m a fly by the seat of my pants kind of dinner maker 🙂 Thanks for stopping by Tanya! 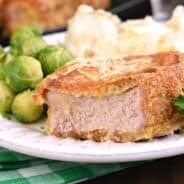 You have such great slow cooker recipes! I just got a slow cooker within the last year and have used the heck out of it. I’m always on the search for new dinner recipe ideas. Can’t wait to try this one! Thanks Elaine! I’m always on the hunt for dinner ideas too 🙂 Not that I ever follow a recipe, LOL. These look so yummy! I need to start using my crockpot more so I’m not as hard-pressed for time when I get home from work. These look yummy! I love slow cooker dinners. It’s awesome to work all day and walk in the door with dinner waiting for me. It’s totally a highlight of the week. This looks awesome, and I love that the slow cooker does pretty much all the work for you! You sure can create on the fly! This looks absolutely delicious! 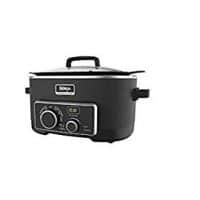 Slow cookers are SOOO nice for rushed days – I can’t wait to try this. Thank you!! They were awesome after a long day to just come home and eat! How delicious! Yummy! 🙂 Pinned it! Love the Italian chicken sandwich! Love this! Now when can I come over for dinner? Totally love this! They look wonderful and delicious and it is even better with the slow cooker! I love all your dinners Aimee! I’m so making this sometime! I want to live inside that sandwich! Thanks Kristin!! I’m hungry again just seeing it today. It’s good to have balance, and this definitely does the trick 🙂 Thanks for pinning Stacy! That sounds like something I would do…forget my list and not be able to remember! Love that you still bought ingredients to do your own version of the yummy sandwich!!! It looks great!!! Sounds super yummy. I love spinach and anything with roasted red peppers! I love using my slow cooker! It’s comes in handy when I don’t want to use my oven in the summer. These look amazing! I love how you added veggies to the sandwich. It makes it healthy, right?? 🙂 Pinning! I have to stop looking at this post, it’s making me too hungry! OMG…I’m so hungry now! This looks amazing! Yum! 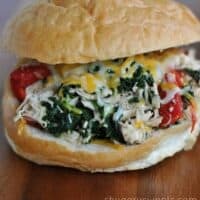 Love the spinach used in this sandwiches!! This is verrrry close to one of my favorite sandwiches, but this is an interesting twist instead of just a chicken breast panini sandwich. The difference would be to change the cheese to provolone and add a little mayo mixed with pesto on the bun. I can’t wait to try the slow cooker version–thanks for the inspiration! Just inhaled the Slow Cooker Italian Chicken sandwich. Thank you for my new go to for lunch! 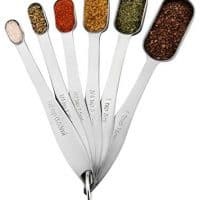 This might be a silly question, but when you say Italian Seasoning-what is that? Is it a premade jar of spice I can just buy or did you make your own? Yes, it’s in the spice aisle. Enjoy!! 1 do you thaw chicken? 2. do you add any water to the chicken awhile cooking the first 5 hours? My family loved the Balsamic shredded beef. Thanks so much! Hello! I wanted to try and make these tomorrow, but I was also wondering about the chicken – if it should be thawed or if it can go in frozen – and do you put any liquids in the crockpot, like water or broth or tomato sauce? I’ve never seen a chicken crockpot recipe with no liquids so I want to make sure I do it right and don’t dry the chicken out! Aimee, you’ve got me wishing I had some chicken cooked right now so I could make this to bring to work for lunch tomorrow! This looks fantastic. Pinned and sharing on social media. Thanks for sharing this link with me in the Food Bloggers Roundup Page. I’ll be using this in my crockpot chicken roundup! Have a lovely weekend! I made the Italian Chicken Sandwiches for dinner last night. They were delish! Thanks for the idea! So glad you enjoyed the recipe! Thanks for stopping by and letting me know!! I just made the Italian chicken sandwiches tonight and it was really good. I was so happy the chicken didn’t dry out. I added a 1/2 cup of chicken stock and used mozzarella cheese instead. My young children loved it. Thanks! Whoohoo, so glad you loved it Jaime!! I work and can’t stop this at 5 hrs and add spinach, could I just throw frozen spinach in and cook on low for 8-9 hours? Can you use fresh spinach instead of frozen for this recipe?